Service Rank and Number / Rheng gwasanaeth a rhif: Private No. 15731. 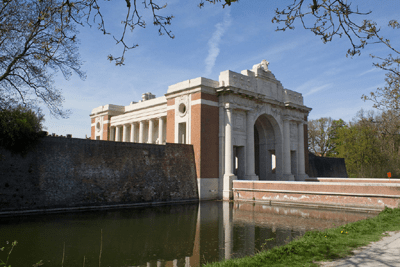 Military Cemetery/Memorial / Fynwent milwrol: Menin Gate Memorial. Medals Awarded / Medalau a ddyfarnwyd: 1914-1915 Star, British War Medal, Victory Medal. Killed in action at Ypres, Belgium on Saturday 19 February 1916 aged 34 years. Samuel Hollingworth was born in Rhyl, Flintshire during 1882. Nothing is known of his early life but in March 1902 he married Emma Fitzpatrick. The 1911 Census shows that the family lived at 12 Russell Road, Flintshire. The head of the family was Samuel Hollingworth aged 30, who was employed as a Carriage Driver. His wife Emma Hollingworth aged 32 and their 5 (five) children – James Hollingworth aged 8, Martha Hollingworth aged 7, Robert Thomas Hollingworth aged 5, Emma Hollingworth aged 3 and Samuel Hollingworth aged 2 years. At the outbreak of the First World War Samuel enlisted at the Recruitment Centre, Rhyl, with 10th Battalion, Royal Welsh Fusiliers. 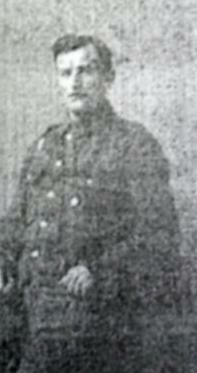 Following training he arrived with the Battalion in France on Monday 27 September 1915. He served in France and Flanders. He is remembered on a Remembrance Plaque at the Royal Alexandra Hospital, Marine Drive, Rhyl, Flintshire and on The North Wales Heroes Memorial Arch, Deiniol Road, Bangor, North Wales. There is a Flintshire Roll of Honour Card for Samuel Hollingworth at the County Archives Office, Hawarden, Flintshire.